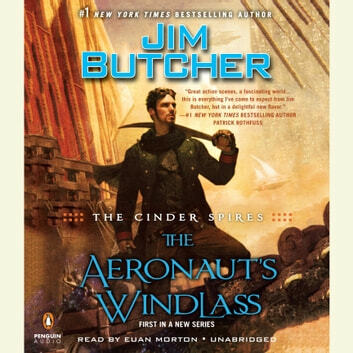 Jim Butcher, the #1 New York Times bestselling author of the Dresden Files and the Codex Alera novels, conjures up a new series set in a fantastic world of noble families, steam-powered technology, and magic-wielding warriors. . . . Since time immemorial, the Spires have sheltered humanity. Within their halls, the ruling aristocratic houses develop scientific marvels, foster trade alliances, and maintain fleets of airships to keep the peace. Captain Grimm commands the merchant ship Predator. Loyal to Spire Albion, he has taken their side in the cold war with Spire Aurora, disrupting the enemy’s shipping lines by attacking their cargo vessels. But when the Predator is damaged in combat, Grimm joins a team of Albion agents on a vital mission in exchange for fully restoring his ship. And as Grimm undertakes this task, he learns that the conflict between the Spires is merely a premonition of things to come. Humanity’s ancient enemy, silent for more than ten thousand years, has begun to stir once more. And death will follow in its wake. . . .